SCA alumnus Meera Menon ’12 gained much attention for her unique storytelling with a film winning the Nora Ephron Award at the 2013 Tribeca Film Festival and the other debuting at the 2016 Sundance Film Festival. Menon recently discussed her storytelling perspective as a first generation immigrant, the beginnings of her academic career at SCA, and her experience directing widely praised Farah Goes Bang and recent sensation Equity. What in your past has shaped your creative voice and perspective? Of all things, I’d say my perspective as a first generation immigrant. My parents immigrated to this country in the 1970s from India, and I grew up feeling like I was juggling two lives: my “Indian” life and my “American” life. Occupying this sort of liminal ground has allowed me, I believe, to exist both inside and outside of things at once. It’s a useful shape shifting quality that most folks with an immigrant background can attest to, and it is a very useful quality to have as a storyteller who traffics in empathy. Could you share about the beginnings of your academic career at SCA? How did you decide to pursue an MFA in Production? I was working in New York City as an assistant for first an artist, and then a documentary filmmaker, and I needed to get serious about being a professional filmmaker. It was what I always wanted to do, but up until then had been entirely self taught. Being in an academic environment had served me well in the past, and so I took a chance and applied. I had visited USC and was completely blown away by the facilities and environment—I knew going to school here would make me experience filmmaking at a level that I had up until then, only dreamed of experiencing. 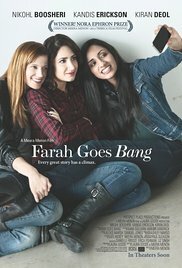 As director, co-writer, and co-editor, how was your experience creating Farah Goes Bang? What was the inspiration behind the narrative? Basically I wanted to make a feature for the same amount of money I saw fellow students making thesis films. My dear friend from college had written a brilliant coming of age novel called Sister Mischief, and we organically began a conversation about writing a coming-of-age movie. We knew pretty quickly that we wanted it to be politically minded, as a way to separate it from other coming-of-age narratives. I also knew that a road movie could be executed on a micro-budget, being a huge fan of the Duplass brothers’ film The Puffy Chair. We then partnered with like-minded filmmakers, many from my film school experience to get it done (including my own husband, Paul Gleason, who shot the film beautifully). Paul had inspired a group of us, when we graduated, to go in on a camera package together so we could all keep shooting our own projects outside of USC. Farah Goes Bang was shot on that camera package. How did you become involved in Equity, and what was it that drew you to the project? I was introduced to the producers of Equity through Mark Stolaroff, a mentor and friend who was an enormous help for us on Farah Goes Bang. He is an instructor at the No Budget Film School, a set of courses I’d highly recommend taking if you are thinking of shooting a micro-budget film for the first time. I was drawn to the project because of the intelligence of the writing. I had taken a swing at writing a female-driven Wall Street movie in the feature writing sequence at USC (533a & 533b), but I felt like Amy had really knocked it out of the park in terms of being a feminist piece that was not too didactic, and in fact, was just a well-written corporate thriller. Equity was accepted into the Dramatic Competition at Sundance this past year. What was the experience like for you personally? How has it changed your career? It was definitely game-changing. I got representation out of it, and now feel privileged to be a part of that Sundance family. I met extraordinary filmmakers that make me want to be better at what I do. Personally? It was a daze. We had just finished the film two or three days before. I think everyone walks through that experience a bit of a zombie. How do you hope your work impacts its audience? I hope people that feel underrepresented in movies and TV see themselves in the work I do. That’s why I wanted to do it, and that’s what makes me continue to want to do it. Any advice for current students? Think about what you are going to do after you graduate now. If you want to direct, think about how you can keep self generating content—no one is going to offer you that opportunity straight off the bat (unless you are very lucky). So you have to be making moves, partnering with like-minded friends and collaborators, figuring out how to self generate. What are you up to now? Self generating. Always. For more information on Meera and her work, please visit her website.